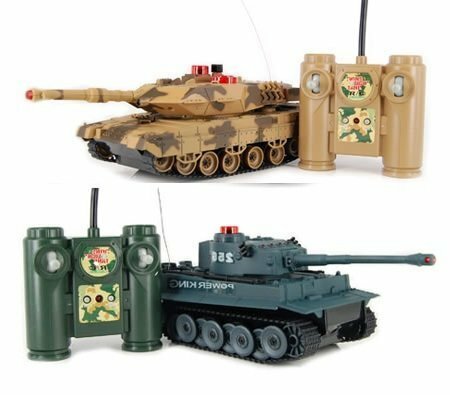 Get ready to wage war with these Infrared Battle Tanks. They come in a set a two so you can battle your opponent with infrared power. They are controlled by a simple transmitter that lets you rotate the gun and fire a cannon. Once firing, the tank roars and sends an infrared beam signal attacking the opponent. Once hit by the laser, tanks become damaged, indicated by the flashing lights. Makes a great toy for adults and children of all ages. Get yours today and battle with a friend. 4 LED Indicators for your “Lives”. Every time you get hit you lose a life Full Size – Up to 30cm in length! Awesome sound effects: Ignition, Engine, Cannon Fire, Machine Gun Fire and Impact. Rechargeable 4.8V NI-CD battery, Battery for the controller: 2pcs AA Forward & backward, speed up, turn left & right, universal spin, the barrel moves up and down 30° the turret turns 320°, automatic demonstration function and infrared combat functions. With sounds.1 Brand New Set of 2 IR Battle Tanks.